After the Installation, it was serendipity that the next two engagements were with the armed forces, familiar territory for a former guardsman. The first was a reception at the headquarters of the London Scottish Regiment in Horseferry Road SW1. I had walked past the building many times when I lived in Victoria, so it was interesting to see the interior which is a classic, Victorian-style drill hall: an open area for drill and training, with cast iron galleries above leading to various offices and stores. 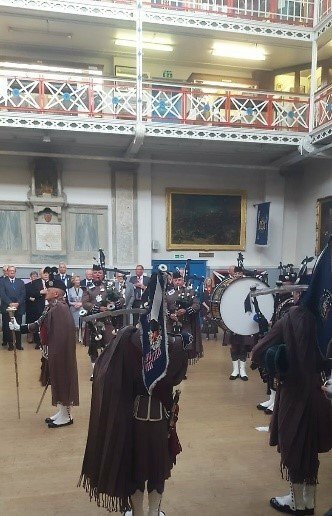 The MoD have recently vacated the building, which is owned by the Trustees of the London Scottish, so the Drill Hall now houses the Regiment’s museum and is available for events and dinners. At this reception we were entertained by the pipes and drums of the London Scottish wearing a tartan with no pattern. I thought this looked, rather confusingly, like the Irish Guards – but I was speedily corrected! The following evening (Friday 13th! 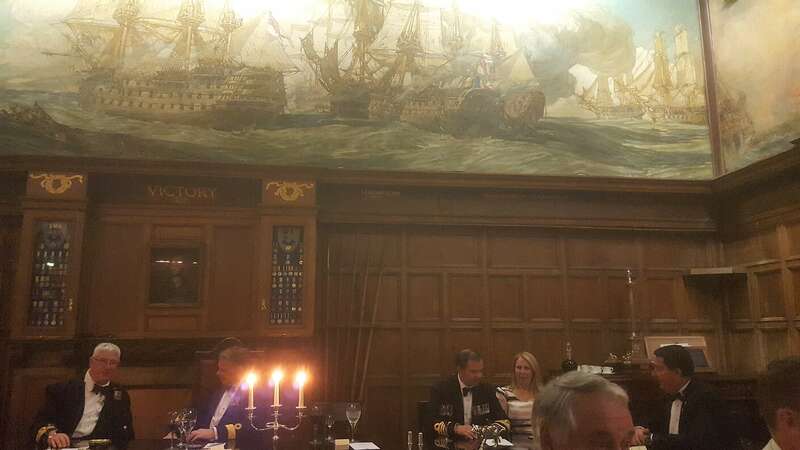 ), I was in Portsmouth for the “COMPORFLOT Awards Dinner” with the Royal Navy. On arrival, I was able to decode the occasion as the annual awards by the Commander Portsmouth Flotilla to those who had achieved outstanding service during the last year. There were about twenty awards, presented in brilliant sunshine on the deck of HMS Victory with the recipients’ families present. Each award was presented after the reading of a citation. The most memorable being to a junior rating who, firstly, had prevented a manoeuvring accident by taking immediate action to fix a steering mechanism and, secondly, identify that the problem was that the wrong lubricant filter had been fitted. His opinion had been ridiculed by various superiors and the civilian contractors who supplied the filters – but he had been eventually proved correct. A well-deserved award I thought. Afterwards, we went to a reception at HMS Nelson (a rather solid naval barracks), where we were served large quantities of gin and tonic served from two-pint jugs. We dined under a splendid panorama of the Battle of Trafalgar (my photograph doesn’t really do it justice) and, as is the Royal Navy’s practice, we remained seated when we toasted the Queen. I was seated for dinner next to the Commander of the Fishery Protection Squadron, Cdr Sarah Oakley, so had a fascinating time learning about the integration of women into the Royal Navy. Cdr Oakley had commanded a mixed crew and I have invited her to come as a lunchtime speaker to tell us of her experiences. Cdr Oakley had been invited to the January Court has guest speaker. On Wednesday 18th, on what seemed to be the hottest day of the year, I was invited to lunch by the Company of Environmental Cleaners on board HQS Wellington. Thankfully the reception was on the quarter deck – and the dining room was air-conditioned. I hadn’t encountered any environmental cleaners before but was soon reminded how critical their work is: “no one gets into a hotel room and no surgeon starts operating until we’ve been there”. One also forgets the scale of the cleaning industry; one topic over lunch was the contract for Dubai Airport. Yet another hot summer’s day was my visit as a guest of the PLA to Gravesend for the unveiling of a statue of HM the Queen by the Bishop of Rochester. After the short ceremony, Michael Russell (Doggett’s winner 1997) was persuaded to pose for photographs. The invited guests took refreshments on the PLA’s Royal Terrace Pier and then Peter Steen, Director of Marine Operations, invited the Commanding Officer of the Royal Engineers at Chatham and me to visit the PLA Operations Room. It was fascinating to see the data available to the operators who control movement on the Thames and very real insight into the complexity of the PLA’s operations. So far, so good. But I was about to be bought back to the realities of being Master by a dilemma with the entries for the Doggett’s Wager. For many years the Wager has been contested in July, often the last official event of a Master’s year of office. This year, as an experiment, the Wager is to take place in early September as a highlight of the Totally Thames Festival – and thus at the start of my year. At the Draw, held at Watermen’s Hall for the first time, it became apparent that there was a predicament: there were only two competitors eligible to row. There were potentially three others, but one was away concentrating on his RYA licence and the other two had still to take their BML examination which would qualify to compete as Freemen. Naturally, the Fishmongers assumed that as Master I should be fully acquainted with the rules for Doggett’s and the individual competitors but, being an ordinary mortal who was never eligible to compete, I have never felt entitled to do any more than note the arrangements for the Wager. Thus, there was some speedy reading of the rules and a hasty review of the situation. We await the result of the forthcoming BML examination. My last official engagement before the August break was to attend a dinner with the Worshipful Company of the Founders in their very modern Hall. Another warm evening, but the reception was in the adjoining graveyard. One learns so much about the activities and the trade of other City companies, but I was especially pleased to learn that the skills, records and equipment of the Whitechapel Foundry are all being preserved. The Foundry, which I visited a few years ago with Past Mast Goddard, closes-down after over four hundred years of trading; the site being no longer deemed suitable for industrial use. There being no more engagements until the 1st September, Susan and I then departed for two contrasting breaks: to visit Kiev and the post-nuclear accident site at Chernobyl followed by a reading holiday in Madeira.